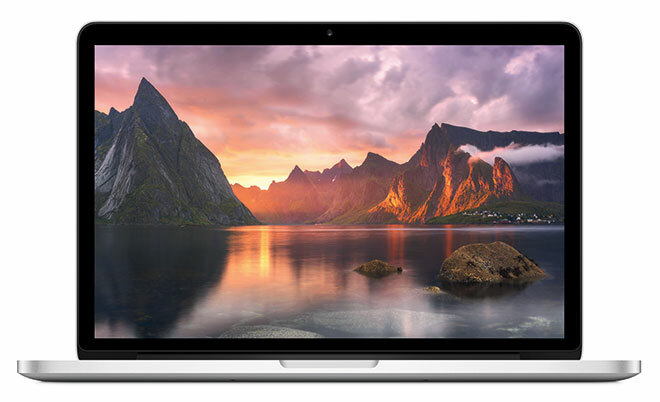 The MacBook Air gets a new fifth generation (Broadwell) Intel Core i5 5250U processor with dual core 1.6GHz CPU (Turbo Boost up to 2.7GHz) and HD 6000 on-board graphics. You can also configure it with an Intel Core i7 5650U with dual core 2.2GHz CPU (Turbo Boost up to 3.2GHz) and the same HD 6000 graphics. There is also Thunderbolt 2, with twice the bandwidth of up to 20Gbps up and down simultaneously. These changes are available are common to both the 11-inch and 13-inch, but the 13-inch model also gets 2x faster flash storage. The MacBook Pro with Retina display gets the more significant updates. For starters, it has the brand new Force Touch trackpad from the MacBook, which is pressure sensitive and the operating system is designed to react differently to the intensity of your clicks with new gestures in OS X. It can now also be clicked across the surface instead of just near the bottom as on the previous trackpad. The Force Touch trackpad provides a software generated haptic feedback that mimics the feel of pressing a physical button. Other than that, the new MacBook Pro with Retina display also comes with the new Broadwell processors from Intel. The first two models have Core i5 5256U processors with dual-core 2.7GHz CPU (Turbo Boost up to 3.1GHz) and Intel Iris 6100 GPU. The top of the line model features the faster Core i5 5287U with dual-core 2.9GHz CPU (Turbo Boost up to 3.3GHz) and Intel Iris 6100 GPU. The first two models can be configured with the i5 5287U from the third model. All three models can also be configured with the Core i7 5557U with dual-core 3.1GHz CPU (Turbo Boost up to 3.4GHz) and Intel Iris 6100 GPU. In addition to that it also has 2x faster flash storage and the battery life is now bumped up to 10 hours of general use and 12 hours of iTunes movie playback. It must be noted that the changes to the MacBook Air with Retina display are only for the 13-inch models. The 15-inch models get none of these changes and are as they were before. The prices for all the MacBooks are as before. The updated 11-inch MacBook Air costs $899 for the 128GB and $1,099 for the 256GB. The 13-inch MacBook Air costs $999 and $1,199 for the 256GB. The three 13-inch MacBook Pro with Retina display models cost $1,299, $1,499, and $1,799. Configure-to-order options cost extra.